Alright kids. Who wants pancakes for dinner? For a little back story, my great grandmother emigrated here from Germany and of course brought some mad cooking skills with her. There is apparently a book of her recipes in German floating around somewhere that we don’t get much use out of, however, Grandma Fanny’s German pancakes are a favorite family recipe. They are thin, like crepes, but a little more rustic and free form. We always ate them for breakfast, with the more typcial crepe-type fillings of fruit and sugar or Nutella. The original recipe makes about 6-8 pancakes, so the recipe here has been doubled. In case you want a smaller batch (and so you don’t have to do the math), if you half the recipe use 3/4 C plus 2 T of flour. To cook the pancakes we have a special German pancake pan. It’s cast iron, but with a very tiny lip. This makes it lighter and easier to handle when turning the batter around in the pan. Luckily, my mom somehow ended up with the special pan, which means I will end up with the pan one day (yay!). This is assuming my sister doesn’t put up a good fight for it, but I live in town and she lives in Kazakhstan which makes her slightly S-O-L on the matter. (Sorry, Sarah! I’m taking the pan!) At any rate, a regular cast iron pan will do the trick, you will just get a little forearm workout in the process. This is the special pancake pan. Note how the pancakes are browned, that is what they should look like when they are ready! Mix all the ingredients except the oil for the pancakes and set aside. According to my uncles, the batter should be "like snot" so if it's too thick add a little more milk. Heat a pan over medium heat. Once the pan is warm, add 1 T of oil and sauté the onions and mushrooms until soft. Add a little salt and pepper to taste as well as the grated nutmeg. Add the meat and cook until well browned. Take off the heat, add the lemon juice and set aside covered and on a burner on low to keep warm. Heat a cast iron skillet or non stick pan over medium high heat. A pan with a low/short lip and that you can lift and turn easily works best. Using a paper towel, spread oil over the bottom of the skillet. Add about 1/4-1/3 cup of the batter to the pan and turn the pan around until the batter almost reaches the edges in thin layer. Cook until golden brown (about 3-ish minutes), flip, and cook until the other side is also brown (1-2 minutes). Remove and set aside on a plate. 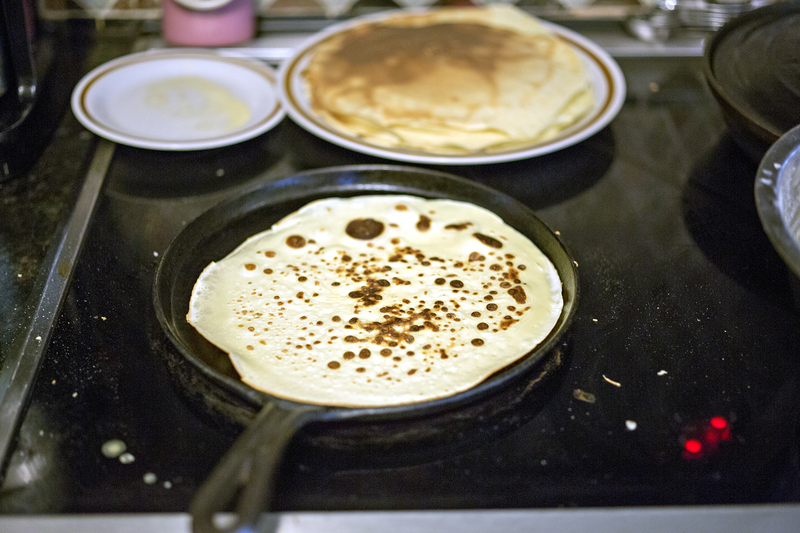 Repeat the process, re-oiling the pan as needed (about every other pancake or so re oil the pan with the paper towel). 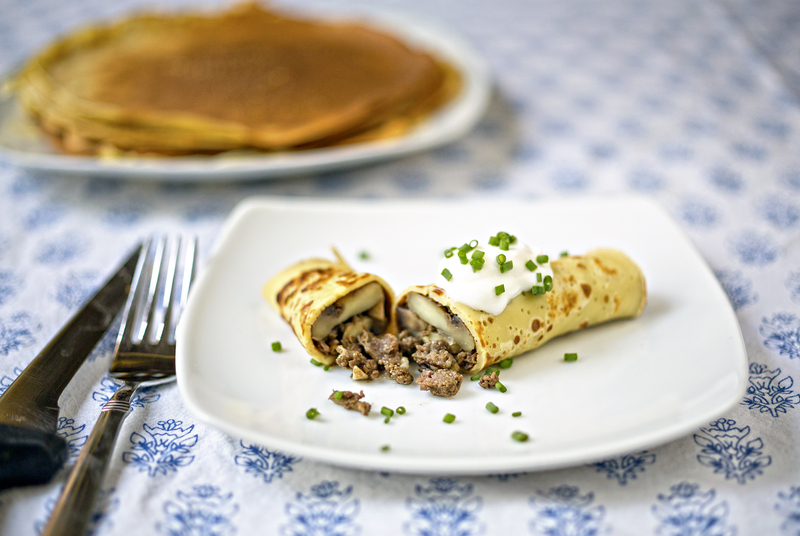 Once all the pancakes are made, put about 1/3-1/2 cup of the meat mixture on a pancake and roll tight like a cigar being careful not to rip the pancakes. 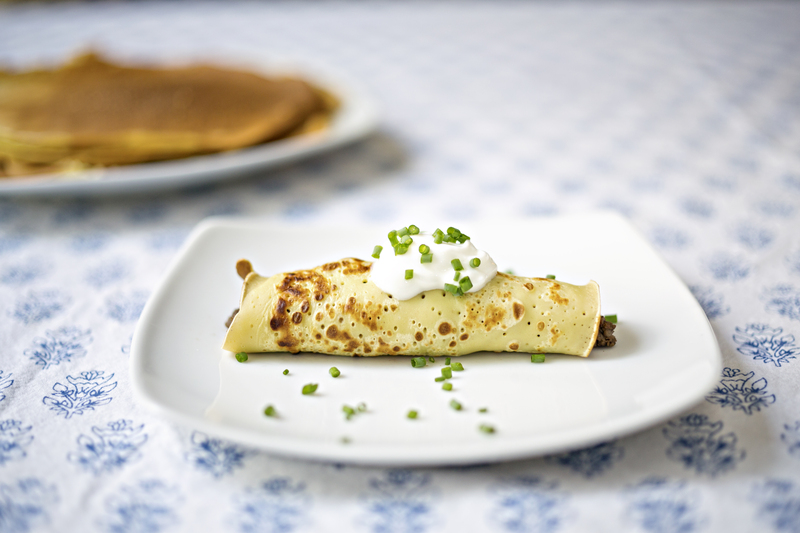 Garnish with chives and serve with a good dollop of sour cream.